Insane Cummins Engine Producing Staggering 1750HP! 1750HP Cummins Engine in a Single Cab Truck! This insane Cummins Engine has been tuned by Industrial Injection to now deliver staggering 1750 screaming horses. Industrial Injection is actually one of the leaders when it comes to supplying the greatest fuel injection turbochargers and components in the diesel industry. Their combined equipment and experience is completely unparalleled. They utilize their knowledge in combination with advanced tech and a very strong desire to lead diesel innovation. They constantly continue to deliver the greatest products and we believe they`ll continue to do for many years to come. This car might be pretty eco-unfriendly. So, if you think that these machines are abominations, this video might not be for you. For everyone else this machine will be one of the meanest cars you`ve ever seen. However, what we would want to know is how much this insane Cummins setup cost. It`s really a wonder how no TV show or magazine ever mentions something like cost of parts. Yeah, labor can be subjective but even if you possess a significant amount of skill and knowhow and decide to work on it by yourself, it`s still going to be very costly. Also, it`s worth mentioning that a slight mistake could end up being catastrophic, not only to your engine, but your wallet as well. 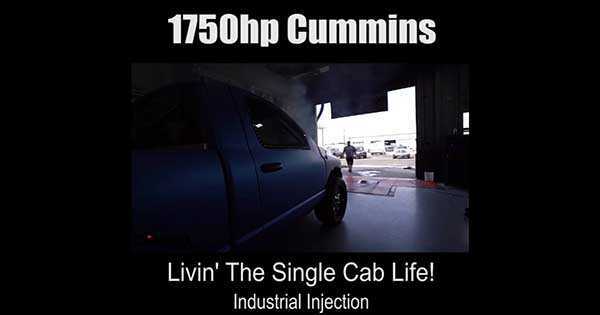 However, watching these guys from Industrial Injection working on this truck with a Cummins engine is a feast for one`s eyes. These guys are true gearhead maestros. At the end of the video you can hear its sound and you will be completely amazed by its fantastic melody. At last, check out the best diesel engines for pick-up trucks!